We got there just before 10 a.m, for the early pickings of fresh local-grown produce from the organic farmer’s market. I read somewhere that Coín is one of the first “transition” towns in Andalucia that aim at creating a more sustainable local economy through initiatives such as this one – a platform for small-scale farmers to sell their produce to local consumers. What a great idea- and it’s certainly going down well, judging from the people that streamed around the stalls while we were there, despite the relatively early hour. With our organic goodies packed away in our car boot, we dropped in to wander around the artisan produce and crafts market, where you can find some great gifts for others or yourself, ranging from natural beauty products, dried curative herbs, handmade very reasonably-priced glazed pottery, homemade jams, honeys…. There’s a small bar and table area where you can sit and have a rest and a coffee before moving on to explore the flea market – as we did. The flea market is a vast jumbled, colourful bazaar despite the dim lighting of the covered parking area in which it is held. Most stall holders lay their wares on sheets on the ground before them : piles of new mattresses stacked next to antique furniture, battered teddy bears, pots and pans, fresh flowers and incense, clothes and house-clearance bric-à-brac – the choice is immense and you can easily spend a couple of hours in there having a good mooch around and find some great bargains in the process! On the way home we stopped off for a bite to eat at a lovely restaurant with an outside patio opposite the Mercadona supermarket outside Coín called La Bohemia – great fresh food, attractively presented, delicious and not too pricey. The restaurant’s walls are adorned with the owner/waiter’s ingenious 3 D wall tapestries – and he has his loom set up by the reception area so that he can continue with his latest masterpiece whenever he has a spare moment. For someone who is totally self-taught (he just took it up as a young boy,so he told us), his creations are rather brilliant! I haven’t any photos, as my camera’s battery had died by then but here’s a link to La Bohemia’s trip advisor page. A complete contrast to my favourite outdoor Sunday flea market in the mountain village of Benahavis (see post), I nonetheless thoroughly enjoyed our morning at Coin’s La Trocha Sunday markets and I’d definitely recommend this as a fun Sunday outing from Marbella Town with your family and friends. 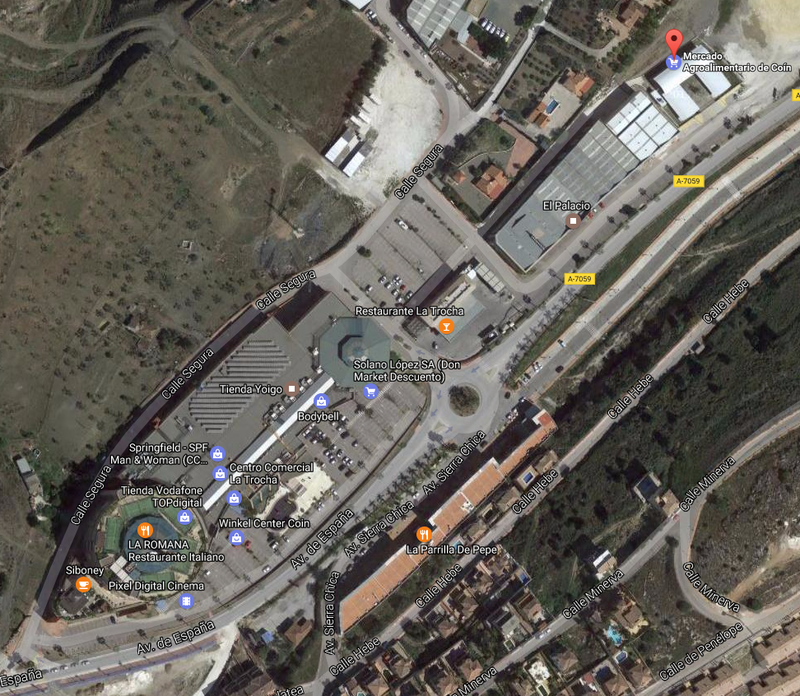 here is a Google earth map with the layout of the La Trocha Industrial estate, showing the location of La Trocha shopping centre and the Organic Farmer’s Market (Mercado Agroalimentario de Coín) – the Artisan & Crafts market is along the strip of buildings between the two. Hi Liz, enjoyed your article! We were there on Sunday, the first time we’ve been. Did you see the puppies? – An English lady took them and all but one had homes yesterday. Whereabouts is the artisan market and the organic market? – Please let me know! Love the blog, Love Coin market. Great photos. Wanna go again now! Do you know whether the markets will be open this (Easter) Sunday? Hello Nick – I have just checked for you and all are open this Easter Sunday. For future information about opening here are the relevant telephone numbers. 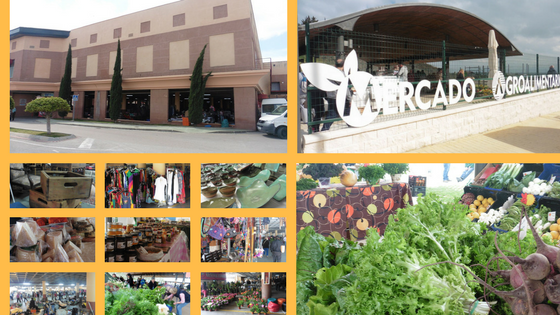 Town Hall for the Farmer’s Market – 952 45 3020 and for the Flea Market – the La Trocha Shopping Centre – 952 45 23 50. I am posting a location map later on today on the blog so people can find them! And if you´re looking for something different to do with friends and family and would like to discover a behind the tourist scene Marbella with me – please go to http://www.facebook.com/MarbellaWalkabouts for information about the local living tours I am doing. If you’re not on facebook – email me at marbellawalkabouts@gmail.com and I can send you the information. Love to read Your blog, Liz! Long time no see, but I hope to be able to come to Marbella this Autumn! Hope everything is fine With Your! !